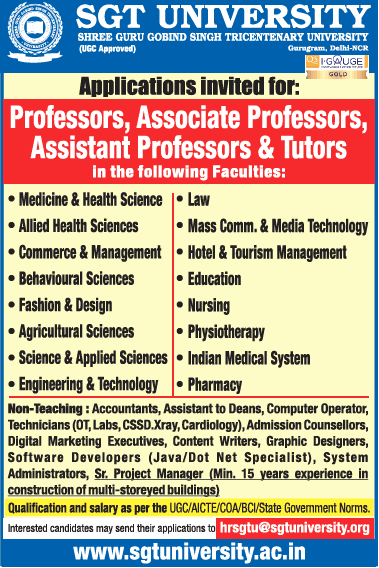 SGT University, Gurgaon has advertised in THE TIMES OF INDIA newspaper for the recruitment of Teaching Faculty- Professor / Associate Professor / Assistant Professor / Tutor Plus Non-Faculty jobs vacancies. Interested and eligible job aspirants are requested to apply as soon as possible from 23rd January 2019. Check out further more details below. About University: Shree Guru Gobind Singh Tricentenary University, commonly called as SGT University, is located in Budhera, Gurgaon district, Haryana, India, in the vicinity of Sultanpur National Park.The university (earlier known as the SGT Group of Institutions) came into existence in 2013 through a Government of Haryana Legislative Act. The school is operated by the Dashmesh Educational Charitable Trust. How to Apply: Interested and eligible candidates are requested to send CV along with copies of certificates and recent PP size photographs to the following email address given below.